Shipping is a difficult industry and moving the heavily laden massive ships in and out of a seaport that is too small to handle the sea freight/demand that is shipped through the port. How do we increase the speed at which the ships rotate through the port, increase the efficiency of the cranes? Increase the size of the docks? The above mentioned might be solutions, but cranes already operate 24 hours a day, 7 days a week, containers are moved away from the harbor as quickly as possible, it’s very costly to expand port! There must be a better way, finding and eliminating bottle necks in the system is the way to go! We found that customs officials only start custom clearing the containers once the ship is docked and is virtually ready to start off-loading, adding 36 to 48 hours that the ship is docked. But no containers can be moved before custom clearances, thus wasting precious docking time at the dock in an already overcrowded harbor. The solution is creating a ruggedized GSM based out-of-band manageable, portable IP65 rated, battery operated virtual LAN on the ship deck linking landward/upward through an omnidirectional antenna to a high-speed radio high-site on land while the ship is laying anchored awaiting entry into the harbor. Then moving the customs officials to the ship by helicopter to initiate and complete the customs clearances of all the containers prior to the ship entering the harbor! This then facilitates that the off-loading process can immediately be initiated once the vessel is secured in the dock, saving 36 to 48 hours per vessel and 4500 commercial vessels visiting Durban’s port annually. 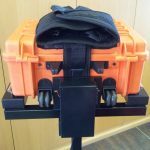 The Netshield portable APN Case has been developed to extend an existing Local Area Network (LAN) with a line of site radio link up to 6km from existing LAN infrastructure. This gives numerous users access to a mobile connection to a network where it is not viable to lay cables or where GSM connection is unstable. The technology is built into a ruggedised, waterproof and dustproof carry case that comes with a trolley attachment and a backpack harness for easy carrying and wearing, making it the perfect solution for those difficult-to-reach, harsh South African working environments. The APN Case is battery operated and will give 13 hours of continuous operation between charges. It is also fitted with a tracker, so that you know where it is at all times. If it’s dropped or man-handled the built-in shock sensor will report the incident to you with GSM. This convenient wireless extension solution is easily configurable through GSM and is also equipped with an external USB port for radio configuration and LAN connection. The APN Case reports on battery status, radio signal strengths and the radio can be switched on or off as required. With the Netshield APN Case, the thought of extending a LAN will no longer give you a headache.